Welcome to the new website of Savvas Pottery, one of the oldest and most renowned potteries in Cyprus. For the last 40 years we develop new materials, new designs but always faithful to the local traditions. Take a look on our online shop and discover unique items, traditional shapes, modern designs of decorative and every day use ceramic craftwork. Savvas pottery located on the old Limassol – Paphos road just outside Yeroskipou has always open doors to its visitors who can experience the making of pottery items. Old and new shapes, Cyprus museum copies as well as custom made ceramic art items are just a few creations you will find in our workshop. We would be very happy to welcome you and show you how we turn clay into elegant ceramic and pottery items used for decoration or for everyday use. 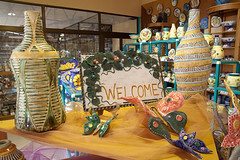 Our doors are always open to all visitors who want to experience local Pottery Art work. Welcome to Savvas Pottery, welcome to Paphos welcome to Cyprus.